Thrissur Pooram is a grand, the largest and most famous of all the poorams held in Kerala, which happens outside the Southern gate of the Vadakkunnathan temple. On the day of Pooram in Medam of the Malayalam Calendar, the people all around the globe witness this enchanting pooram. The then Maharaja of Cochin (1790–1805), Raja Rama Varma who is also known by the name Sakthan Thampuran was the mastermind behind the starting of the Thrissur Pooram. Before that, the largest festival was the one- day festival, which is held at Aarattupuzha, which is known as Aarattupuzha Pooram. The regular participants of the Thrissur Pooram are the temples in and around the city. During the Aarattupuzha Pooram, many of the temples that came from Thrissur were not allowed for the Pooram procession during the year 1798 because of constant rains. Because of the embarrassment, the temples authorities raised the issue with Sakthan Thampuran. Hearing this, he decided to unite the temples located around Vadakkunnathan Temple and prearranged the celebration of Thrissur Pooram as a mass festival. He invited temples with their presiding deities to Thrissur to pay their due respect to Lord Vadakkunnathan, the presiding deity of the Vadakkunnathan Temple. There is something unique about this festival. Everything that is being used in the festival is made fresh every year from scratch. There are various levels of people who are given the duty to design the umbrellas and the nettipattam. Vadakkunnathan Temple is a very ancient Hindu temple, which is dedicated to Shiva at the Thekkinkadu Maidan in Thrissur. This temple has huge walls on all the sides along with a kuttambalam. Vadakkumnathan is the perfect and classic example of the architectural style of the then Kerala. Mural paintings highlighting various episodes from Mahabharata can still be seen inside the temple. The shrines and the Kuttambalam show vignettes inscribed in wood. The temple, along with the mural paintings, has been declared as a national monument by India under the AMASR Act. According to favorite local tradition, it was the first temple built by the sixth avatar of Vishnu, Parashurama. 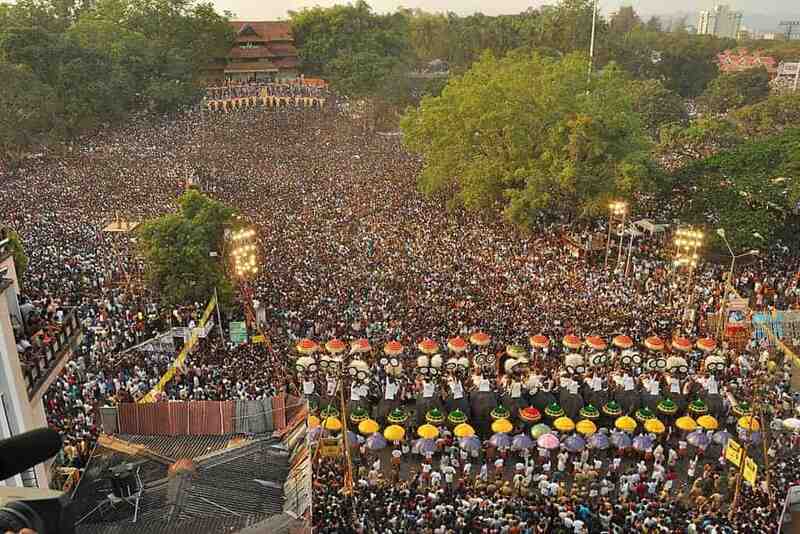 The main venue of the Thrissur Pooram is the Thekkinkadu Maidan, surrounding the Vadakkunnathan Temple. Flag hoisting is the official beginning of the Thrissur pooram. The flag hoisting ceremony (Kodiyettam) begins seven days before Thrissur Pooram. All the taking part temples of Thrissur Pooram are present for the ceremony, and there’s a light firework to announce the commencement of the festival. The first round of fireworks is called the Sample Vedikettu; it happens on the fourth day when the flag hoisting of the Pooram. Thiruvambady and Paramekkavu Devaswom turn by turn showcase this one-hour long firework show. By 7:15 the whole of Swaraj round is all set for the amazing fireworks and many people assemble there to witness this beauty. The show sometimes has innovative patterns and kinds of fireworks. Every year both Thiruvambady and Paramekkavu prepare new and variety type of nettipattam, Chamayam, Aalavattom, Venchamarom, bells and marvelous and various kinds of umbrellas. Paramekkavu Devaswoms exhibits this at the Agrashala in Thrissur town, and the Thiruvambady Devaswoms at CMS high school displays their Nettipattam, Ornaments, etc to the public on the fourth and fifth day before the Pooram. The moment when the Kanimangalam sasthavu arrives followed by the arrival of the other six temples, then the pooram starts. 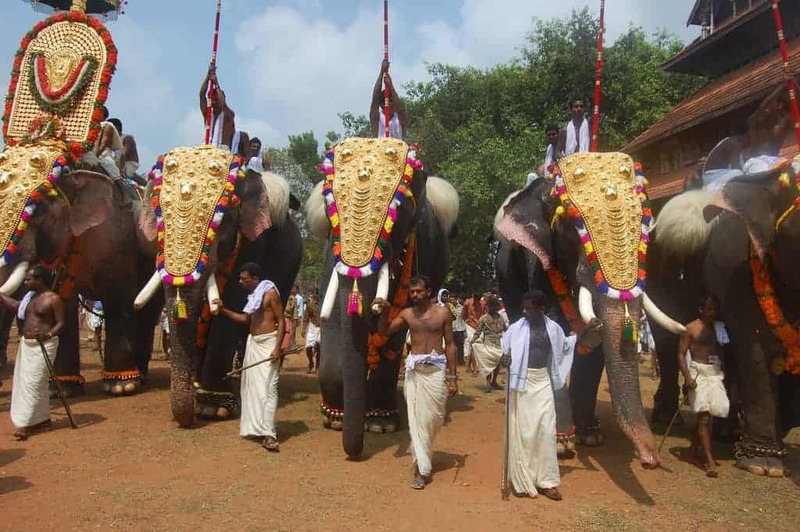 The most critical event in Thrissur Pooram is “Madathil varavu,” a panchavadhyam melam, participating over two hundred artists, with instruments such as thimila, madhalam, trumpet, cymbal, and edakka. At 2:00, within the Vadakkunnathan temple starts the Ilanjithara melam, consisting of drum, trumpets, pipe, and cymbal. Peruvanam Kuttan Marar is the leader of ‘Chenda’ group of Paramekkavu temple. The leader of ‘Chenda’ group of Thiruvambady temple is kizhakkoottu Aniyan Marar. 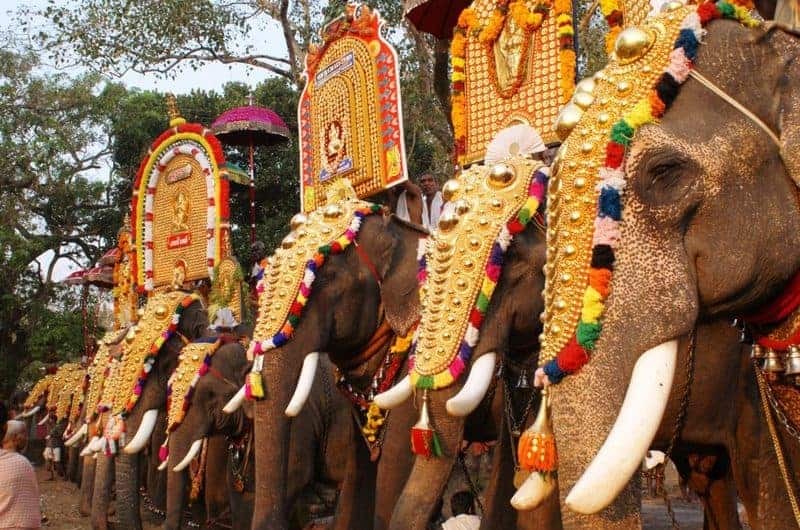 Thrissur Pooram has got magnificent tuskers who are very much adorned with nettipattam, kolam, decorative bells, and ornaments. At the end of the Pooram, once the Ilanjithara melam finishes, both Paramekkavu and Thiruvambadi enter the temple and comes out of the temple and arranges themselves face to face in distant places at the southern gate. Both the groups, exchange colorful and designed umbrellas along with melam which is the attention-grabbing appeal of the Pooram. This is also called as kudamattam. Secular nature is the most prominent and noteworthy feature of this Pooram. All communities take part in the preparations of this festival. Each person has got a role and a part in this festival. The Muslim communities mostly crafted the pandal works, and the churches and their members offer the materials for the umbrellas for the Kudamattom. These amazing fireworks are held in the core of the city, The Thekkinkadu Maidan. Flocks of people come over here to see this fantastic display of firework. The key participants in this event are Thiruvambadi and Paramekkavu. The leading fireworks begin in the early morning of the final day of the Pooram. Mostly all the Pooram fans do not sleep for the whole day to see an incredible display of fireworks. 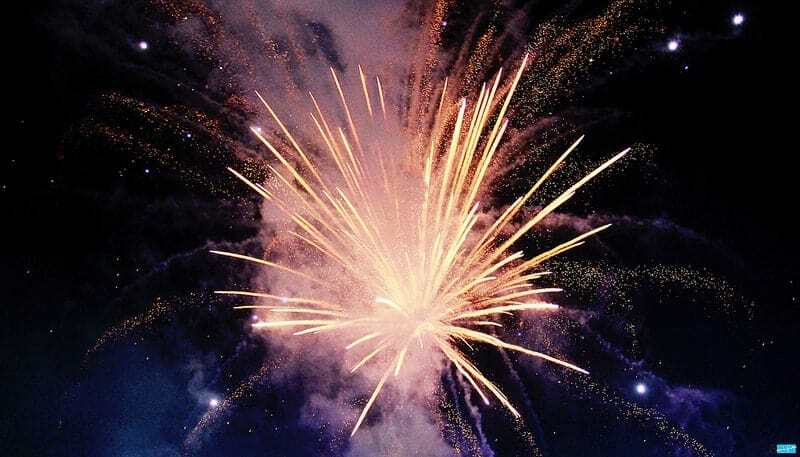 There are four main firework displays in Thrissur Pooram: the ‘sample fireworks’ on the day before the Pooram where the colorful sparklers that light up the sky, one before the Pooram evening, next during the wee hours of the Pooram and finally during the afternoon where the goddess bid farewell to each other. The final day of the Pooram is known as pakal Pooram. For the people of Thrissur, it is not a festival, but it is also a symbol of hospitality. The last event held at Swaraj Round which is known as the upacharam cholal. 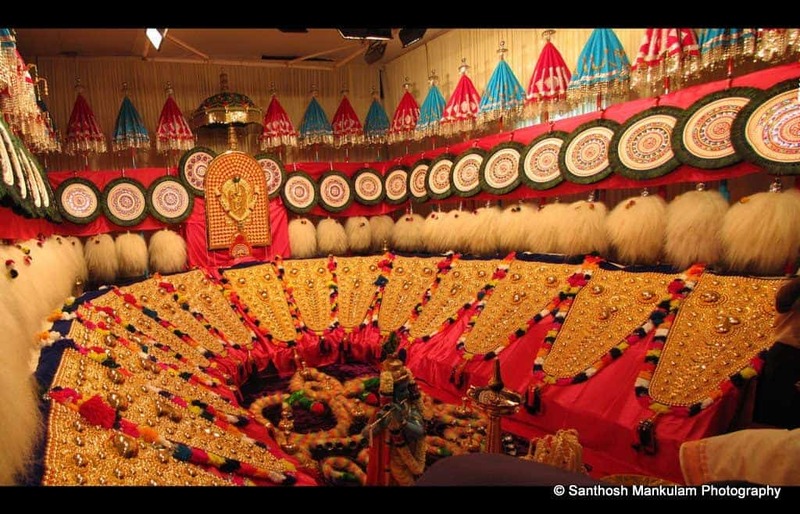 The respective idols of Thiruvambadi Sri Krishna Temple and Paramekkavu Bhagavathi Temple are taken from the Swaraj Round to their respective temples which marks the end of the Pooram celebrations. The grand festival ends with a display of fireworks. Thrissur Pooram is held at the Thekkinkadu Maidan, Vadakkunnathan Temple. The temple has a prime location, at Kuruppam, Anchuvilakku, just 2 km from the Thrissur city. By Air: The nearest airport is at Kochi which is 53 Km from Nedumbassery. By Train: The nearest Railway station is at Thrissur which is 3 km away. By Road: Regular Buses, Cabs are easily accessible from Kochi, Thrissur stations. Now that you know more details about Vadakkunnathan Temple which might have triggered your interest, if you are planning to visit the same do let us know. You can explore places around Vadakkunnathan in Trichur at your leisure. Don’t forget to customize your Kerala tour package with Blue Bird Travels for an incredible holiday experience.